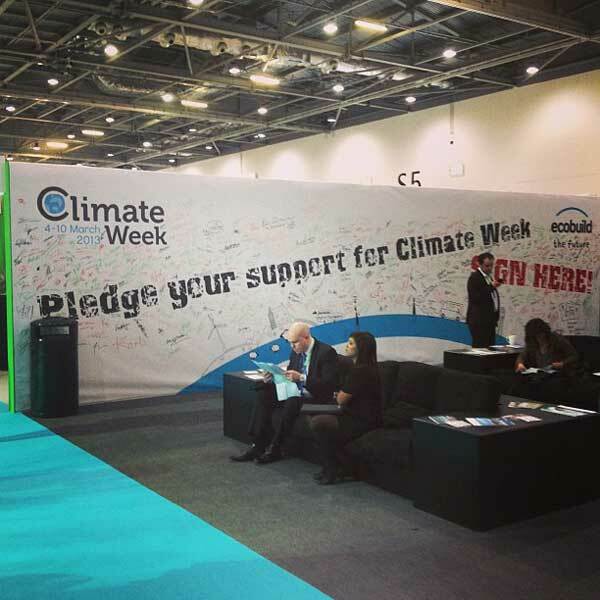 Ecobuild is an event exhibition showcase for developers, companies, organisations and trusts involved in the construction, design, environment, planning and education sectors who have a strong focus on sustainability. 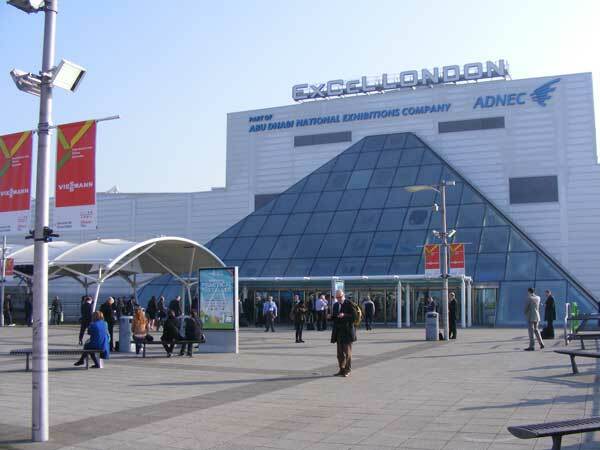 Ecobuild took place this year from March 5th to 7th at the Excel Arena on London’s docklands. 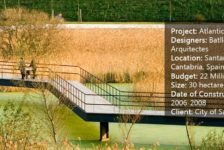 It has become the premier event in the UK for sustainable products and the construction industry, even rivaling those on mainland Europe. 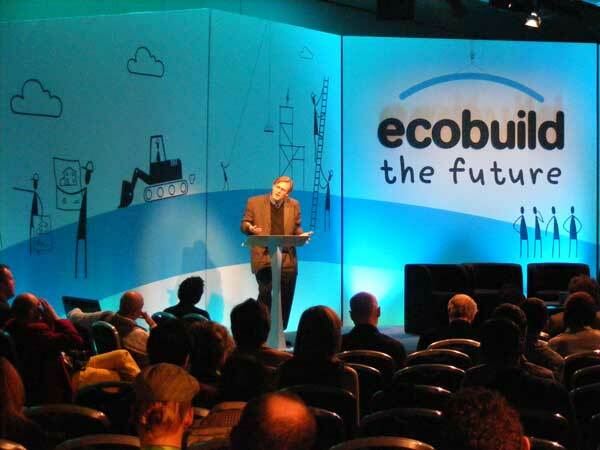 So what’s the point of Ecobuild? It is a must visit event for students, professionals, property owners, the general public, developers, companies and professional organisations. First up; the talks. 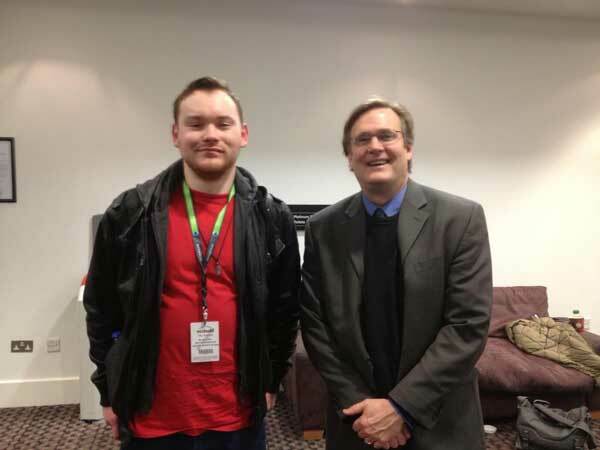 These were a huge step up from last year, with the number of talks increased and the range of subjects covered expanded. 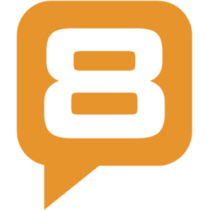 Over 140 talks and seminars by 1,100 speakers. That’s pretty impressive. 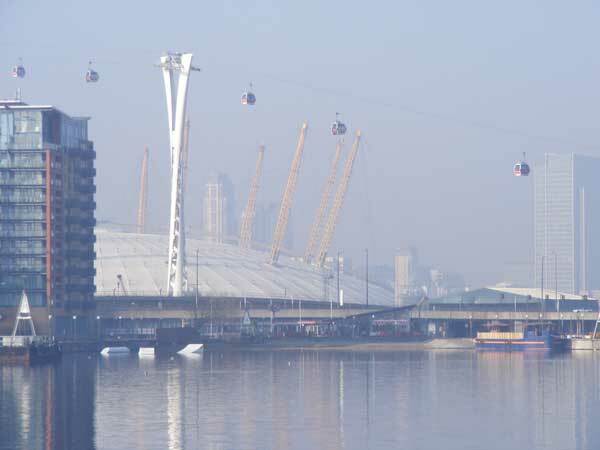 Of particular interest and delivered brilliantly, were the “Delivering Sustainability in the City” talks. 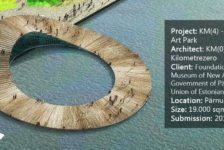 Topics covered included biophilic design, community participation, green infrastructure, WSUD, sustainable transportation, smart cities, urban resilience and urban regeneration. 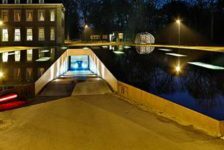 Speakers included Professor Tim Beately of the Biophilic Cities Project, Professor Tony Wong of the Cooperative Research Center for Water Sensitive Cities and Martin Kelly of Trees & Design Action Group. 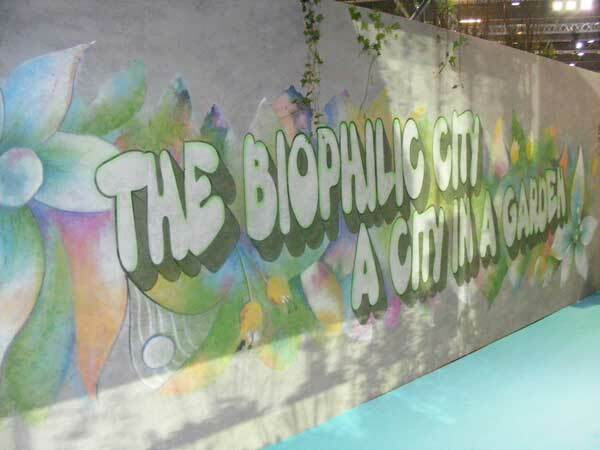 To me, and I may be a bit biased as I am somewhat of a biophiliac, the best lecture was given by Professor Beately on the subject of Biophilic Cities. Professor Beately discussed his experience of cities around the world who are engaging with nature, as he seeks to complete a film based on all the cities taking part in the Biophilic Cities project. 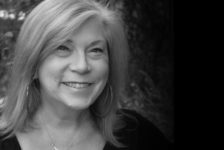 From watching bats in Austin, Texas at sundown, to the day-lighting of streams in Oslo, Norway, Professor Beatley really sold the idea of biophilic cities to the crowd with fantastic case study examples and enthusiasm. Another lecture that stood out among the rest was the “Making the most of Green and Blue Infrastructure”, which dealt with the economics and delivery, but perhaps more interestingly, the aesthetics of GI. Moving on to the exhibits, well, there are just too many to mention here! 850 exhibitors! Not to mention countless numbers of sustainable products being showcased. 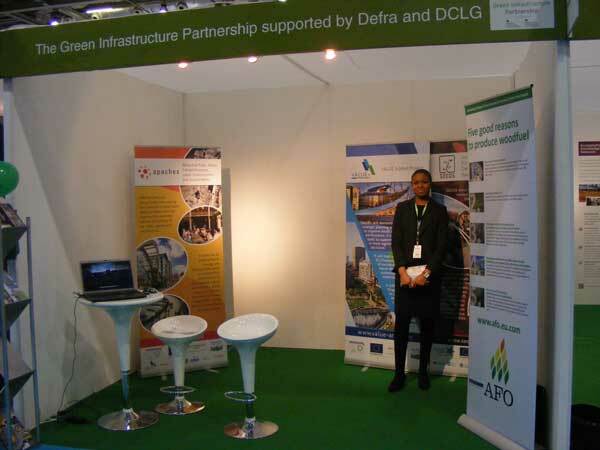 First up, we have the Green Infrastructure Pavilion, hosting the Landscape Institute(LI), CIRIA, AECOM, DEFRA, DECC, BIS & DCLG, who together, with support from some of their 270 partner organisations, make up the Green Infrastructure Partnership. 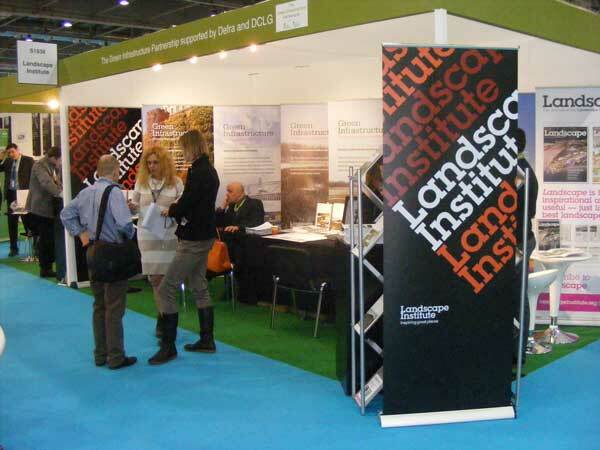 The push and buzz around the pavilion was the launch of two new documents at Ecobuild 2013: The LI’s new GI position statement and CIRIA’s “WSUD in the UK” guidance document. A special mention has to go to the South Yorkshire Forest group and their interaction with the public on behalf of the Green Infrastructure Partnership. 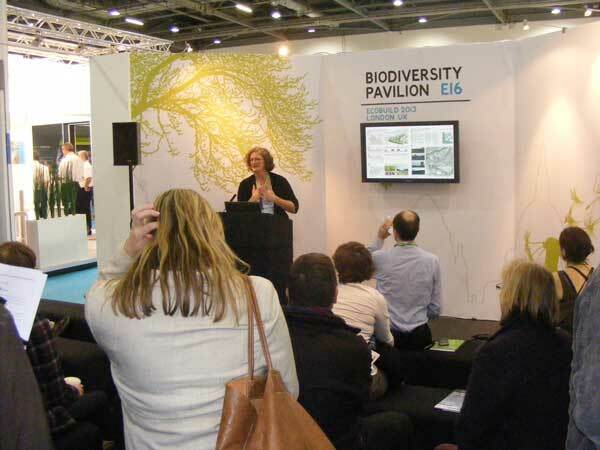 Moving on to the Biodiversity Pavilion, which never had a dull moment thanks to lectures being given by RESET’s Blanche Cameron and Dusty Gedge, the president of the European Federation of Green Roof Associations , who were representing the Green Roof Consultancy. 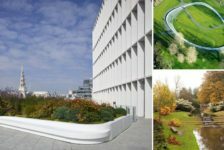 Talks ranged from GI, to urban trees and green roofs. 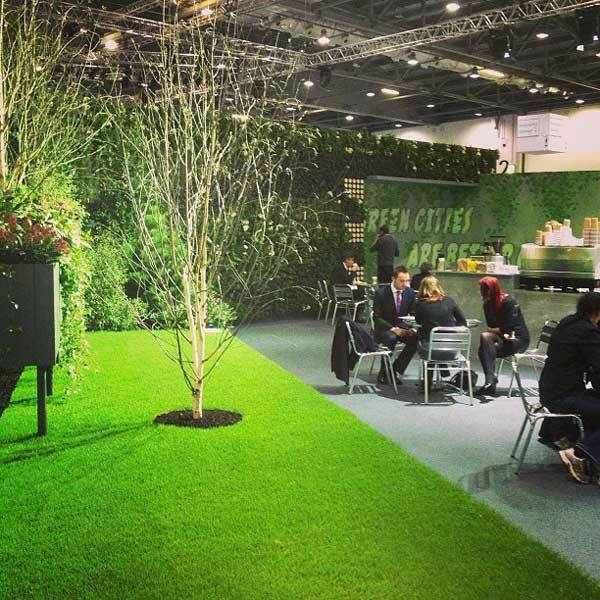 The pavilion was covered in green walls and green roof displays adjoining the Ecobuild Arena which was covered in green itself! Exhibitors here included the Center for Alternative Technology (CAT), Habitat Aid, the Green Roof Consultancy, the Ecology Consultancy and RESET. 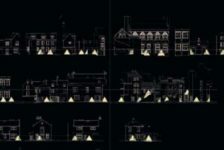 The University of East London’s School of Architecture put on one amazing display. 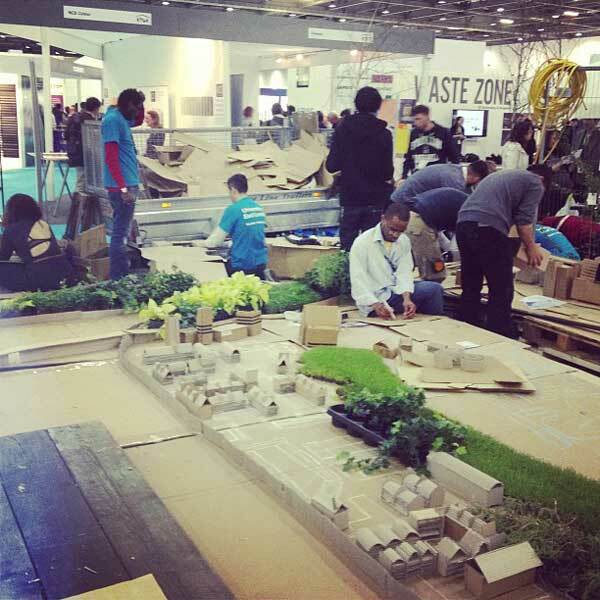 Their students laid out a massive model, displaying the intended master plan for the redevelopment of Canning Town in South East London. Starting on Tuesday morning, the students worked right through to Thursday to get the model finished. 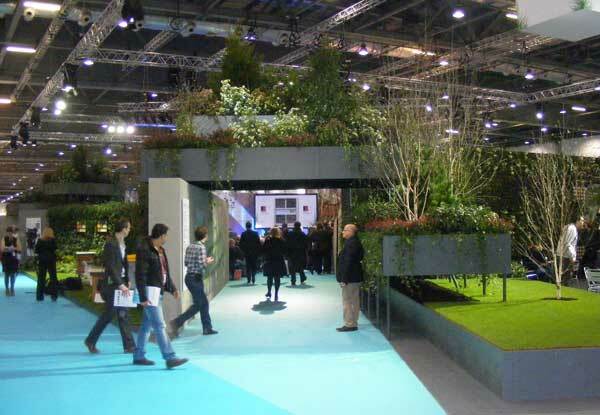 The students pulled out all the stops and created one of the most successful exhibits at Ecobuild. 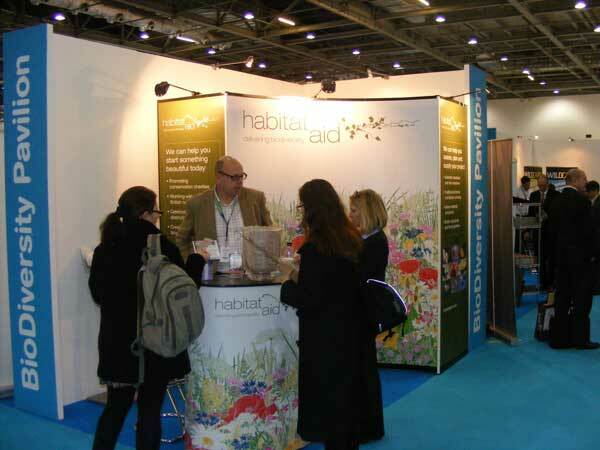 A special mention must go to Barcham Trees, the largest tree nursery of its type in Europe, who provided much of the vegetation at Ecobuild and gave great support to the event. 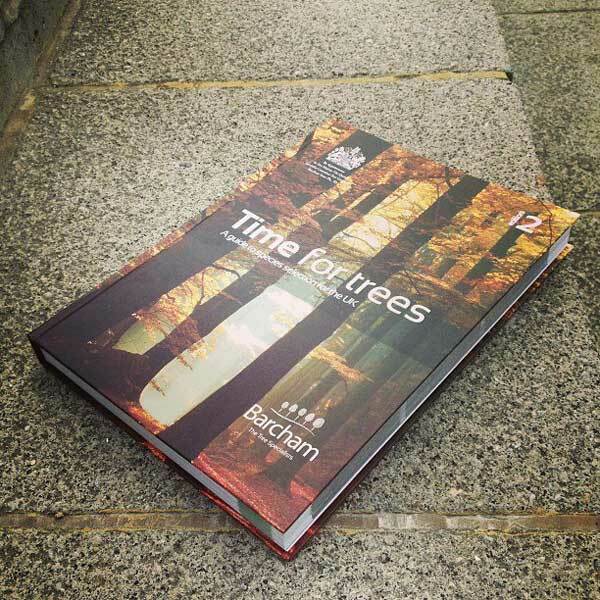 They were giving away free hardback copies of their guidance book “A Time for Trees”. 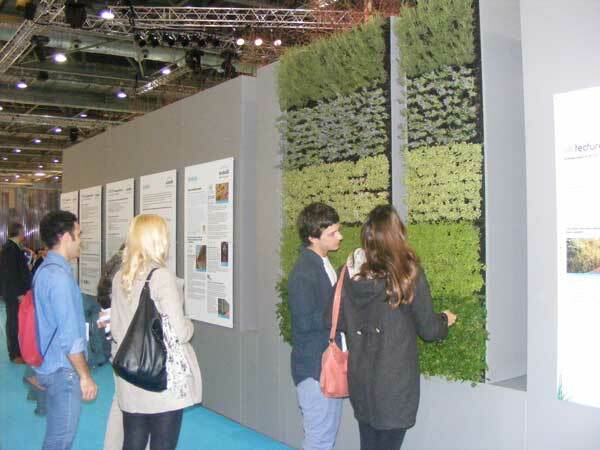 The Ecobuild Arena was fantastic as well, a practical jungle inside the Excel Arena, hosting a number of key talks, while displaying some pretty impressive green walls, vertical gardens and wall murals. The RIBA bookshop proved popular as well, selling publications of the event’s key speakers and exhibiting organisations. 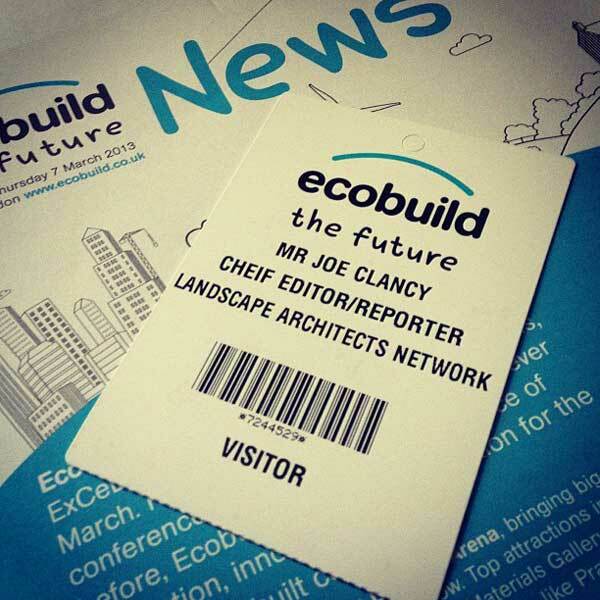 So, Ecobuild is over for another year, but don’t worry if you missed it, it’ll be back next year, 4th-6th March 2014. 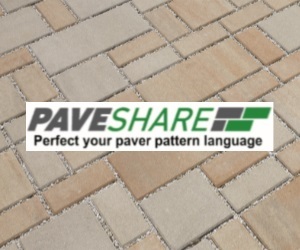 It is truly an event that is representative of trends in the construction, development, planning and design industries. 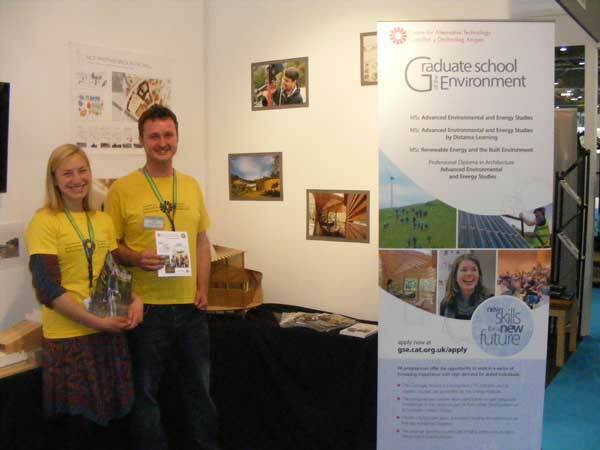 It is a must for any professional, student or member of the public interested in sustainability. It’s also a chance to meet and talk face-to- face with the big players in our industry all in one place, gaining a critical insight into what they think of the industry at present and where its future lies.